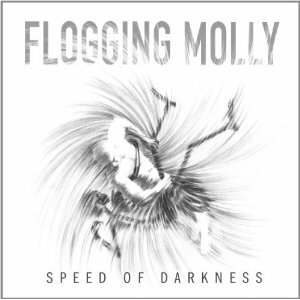 Flogging Molly’s fifth studio album, Speed of Darkness, is one of their best works yet. They have always have focused on the problems on the working man and Speed of Darkness is no different. With the current economy in shambles, the Celtic rock band has never been more relevant. The band relocated to Detroit for this album. It appears that Detroit’s economic woes have woven themselves into Speed of Darkness. This is apparent in the album’s best track “The Power’s Out.” Front man Dave King sings “The power’s out, guess it’s par for the course / Unless you’re a bloodsucking leech CEO.” The drums alone in this track are reason enough to listen to this song. They are vigorous, dynamic, and gets your heart jumping. Flogging Molly’s signature sound of blues, rock, and punk are still alive as ever, but this time sounds more mature. While the album is heavily socially conscious, it still has the sounds of a drunken Irish song that Flogging Molly’s fans have grown to love. The success of the album heavily relies on the voice of King. His voice is a perfect mixture of grit, vulnerability and vitality. His voice is the ideal poster child for the working man. King doesn’t have typical front man charisma with gloss and pretense, his voice seems more real, almost like it can crack from the pressures of life at any minute. This genuineness is more endearing. The only problem with the album is the few tracks that are over produced and glamorized. Luckily, that is few and far between on Speed of Darkness.